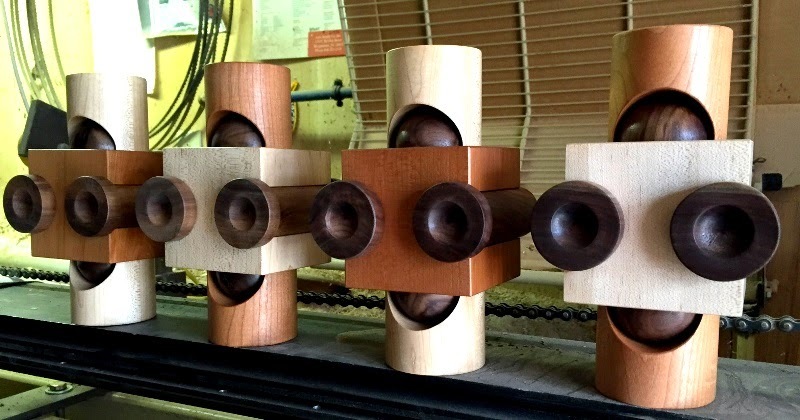 Fine art, antique restoration, and creative design in manufacturing. 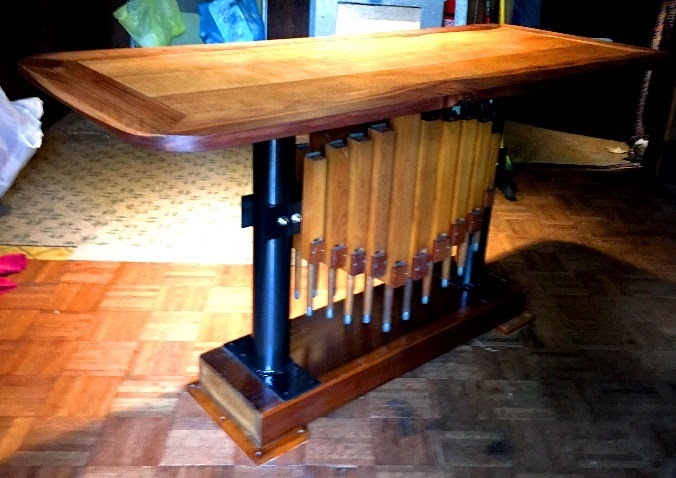 A walnut-edged quarter-saw-white-oak table top sits on a base created using vintage pipe organ notes. The table top has a butcher block finish. 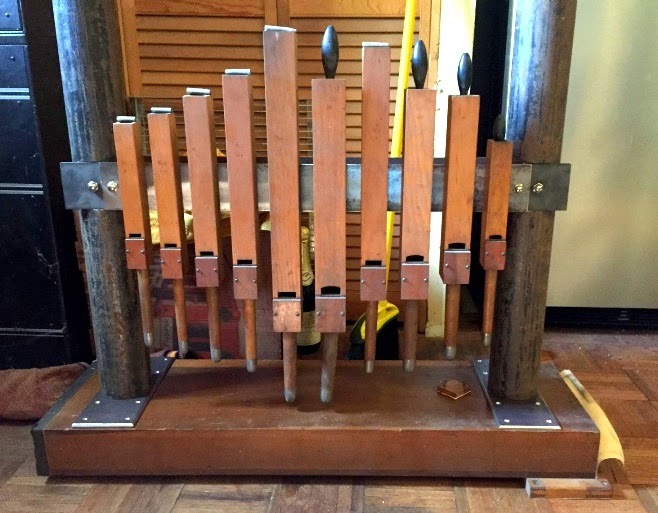 The organ notes were first cleaned and then preserved using a high grade furniture wax, which has been applied to both the pipes and the table top. The steel posts have been finished in black. 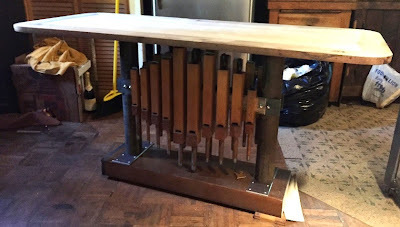 Notice that there are pipes/notes placed on both sides of the table base. Update: The finished table, drying at Roger's place. Wow! and an aerial view of the unfinished table top. finished individually before the final assembly. Below is his first pic of the work in progress. 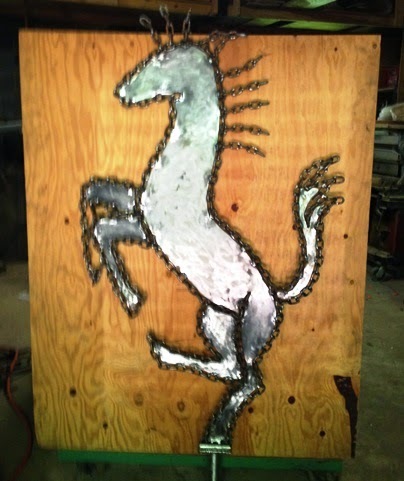 A six foot high Ferrari prancing stallion became one of Becart's latest works of art. 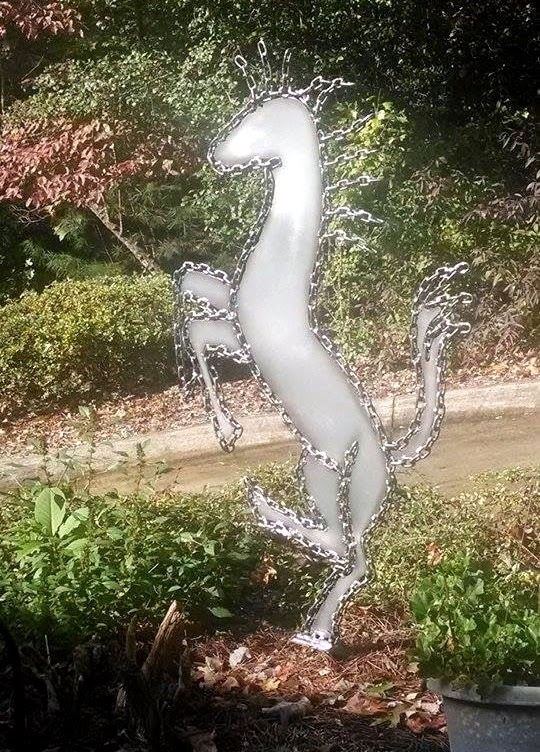 This famous symbol of the Ferrari race team - the Cavallino Rampante ("prancing horse") was designed to be displayed outdoors. 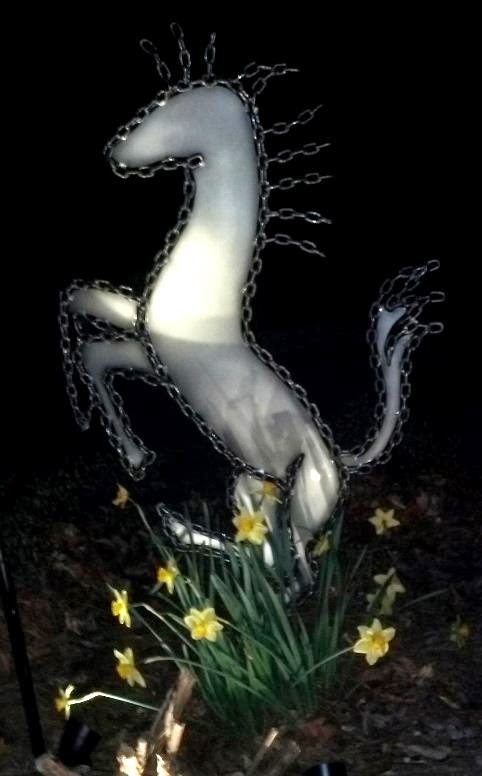 Roger painted the Prancing Horse silver, with charcoal-tinted edges. 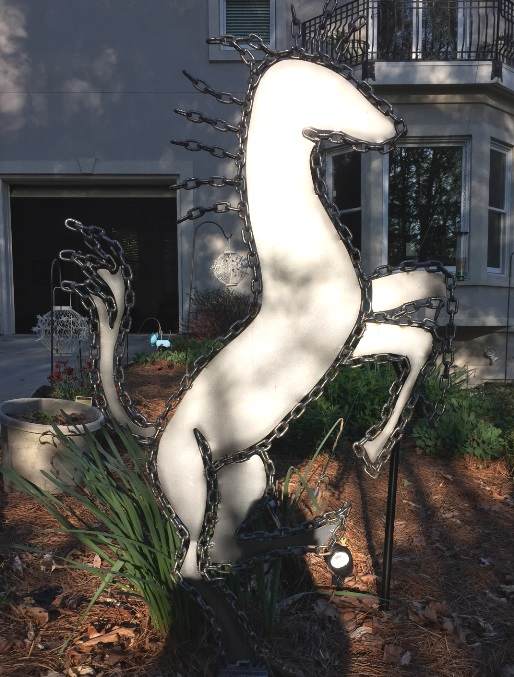 The sculpture stands 6' tall and sits in a custom base. In order to accommodate the earth's rotation and changing reflection of the sun, the figure can be rotated according to season. Sold to a special customer with excellent taste! Update pic: High noon, six months after installation. When it was installed in the fall. The project at the beginning. they will take from you and it will cost you. they will add to you and you will both increase." Twice a year, Homer, Roger's parakeet, sheds a few of his feathers. 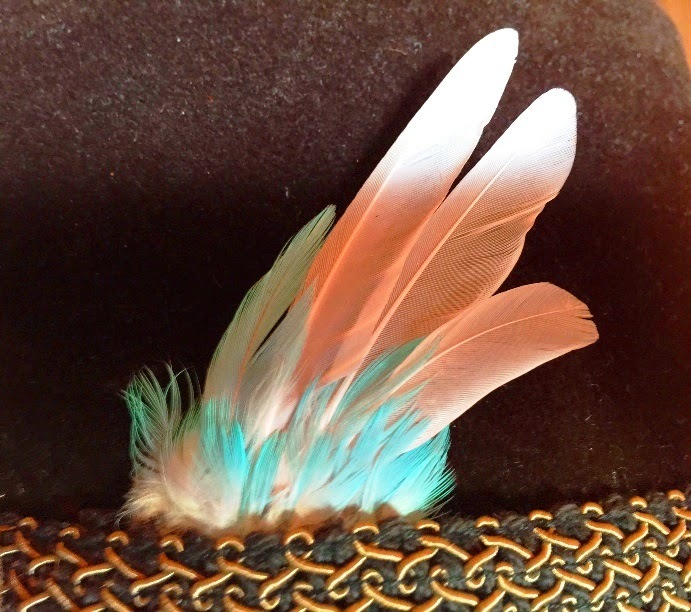 Being the kind heart and dedicated re-purpose king we all know Roger to be, he glued the plumes on a leather hat band for a friend. The ultimate recycle! Truly, he earned a feather in his cap. 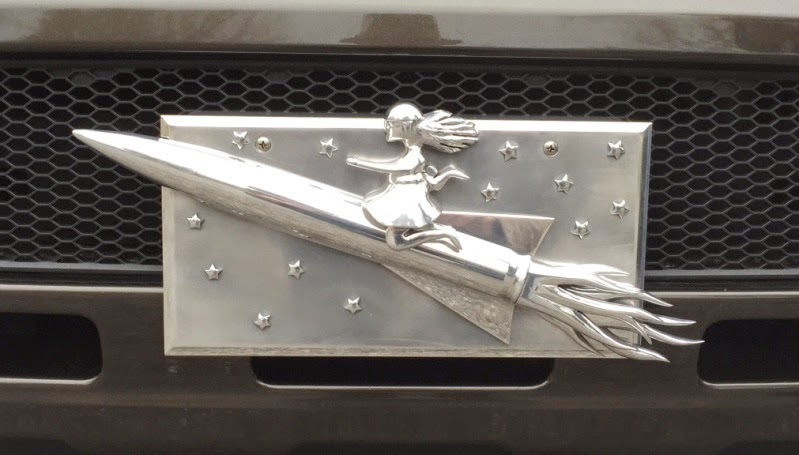 Custom License Plate with "The Rocket Girl" on it. 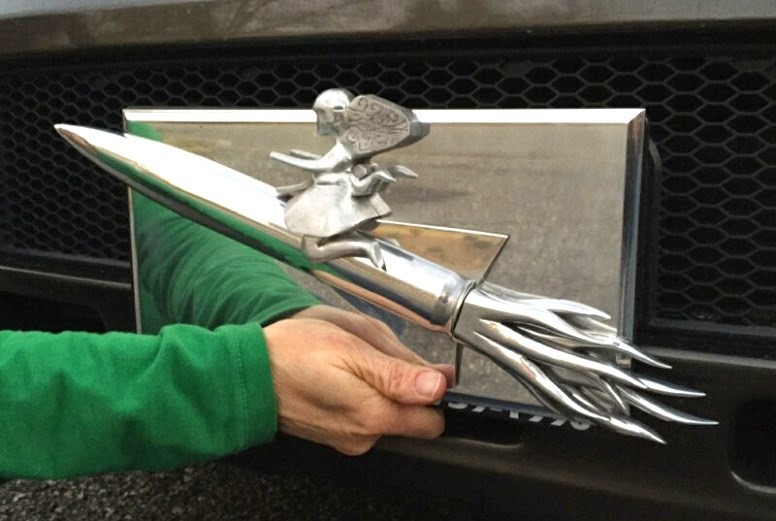 Details: Made out of aluminum, with a polished finish on all the parts except the back, which has a foggy/mottled finish. Stars are polished. 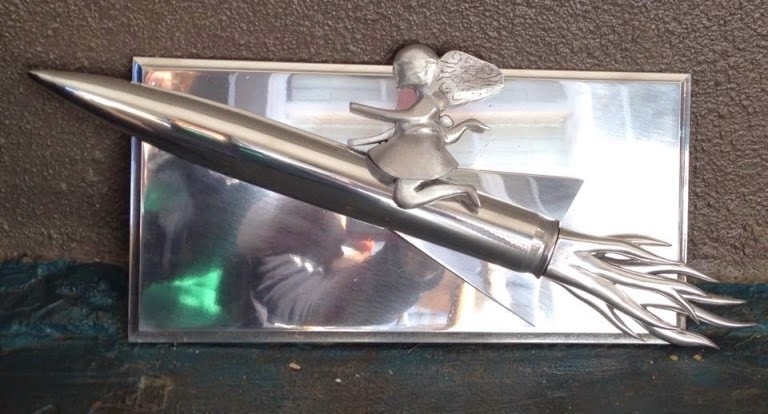 The girl was carved out of a solid 3" x 4" x 1-1/2" thick piece of aluminum. Becart is a small, family owned business located at the foot of the Blue Ridge Mountains in North Carolina. We specialize in one-of-a-kind custom products. In this peaceful mountain setting, we dedicate each day to manufacturing excellence. We take our time, hand craft each product, and pride ourselves on the high standard of quality we consistently achieve. 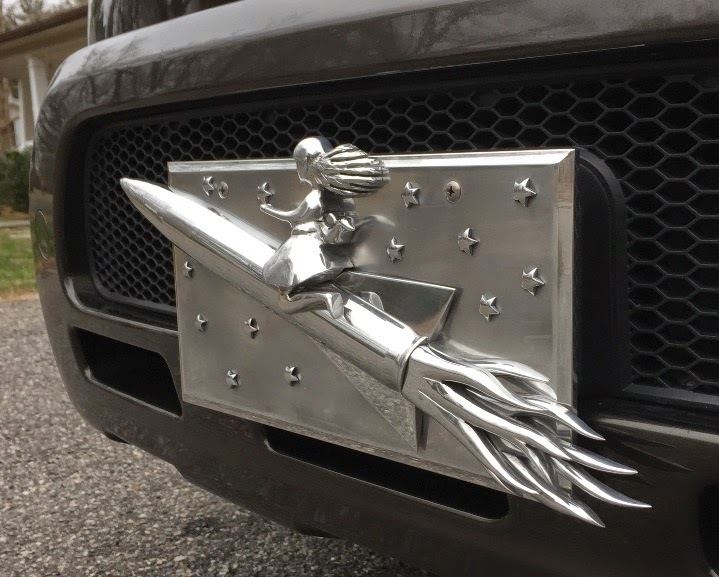 Looking for an Auto Part? Search for the right part at the bottom of the page. If you cannot find what you are looking for, call Roger and he will make it for you! -Your Grandfather's antique gun cabinet is missing trim. -Uncle Bob's '57 Chevy needs a gear shift. -The family rocking chair has a broken rung. 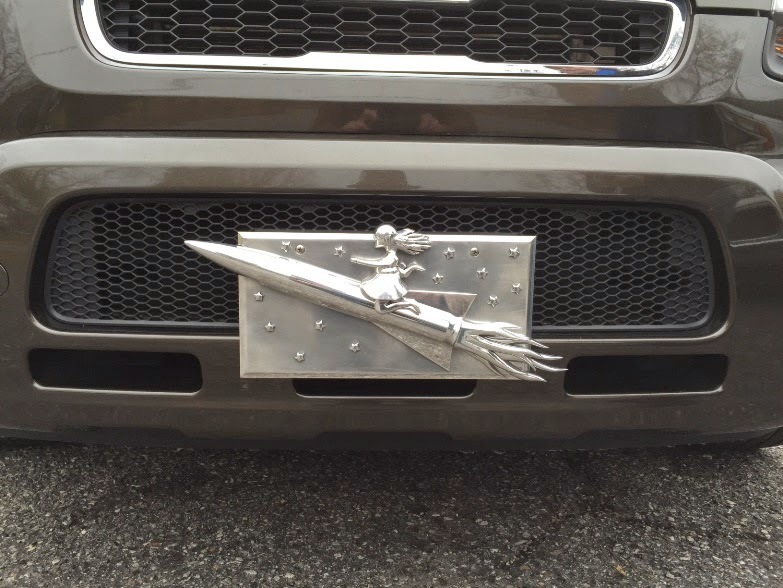 If you need a one-of-a-kind replacement part, give Roger a call. - Did you ever envision a solution to a problem, but have no way to prove your theory? - Were you ever inspired to create an invention that would improve someone's quality of life? -Have you ever needed someone to solve an existing design problem? I can't say that Roger will solve all the world's problems, but I can tell you that he can assist YOU in the quest. Please note: All inquires are kept in confidence. If the part you need is on the market, you can find it here, at Amazon.com. If you cannot find what you are looking for, give Roger a call and he will make it for you. Copyright 1998 - 2015 by Becart Custom Products ... Email: rc@becart.com .... Picture Window theme. Powered by Blogger.